Dessert week dawns and it's a particularly creamy few days in the tent with the contestants asked to master crème brûlée, an Austrian meringue cake and a multi-tiered cheesecake tower. 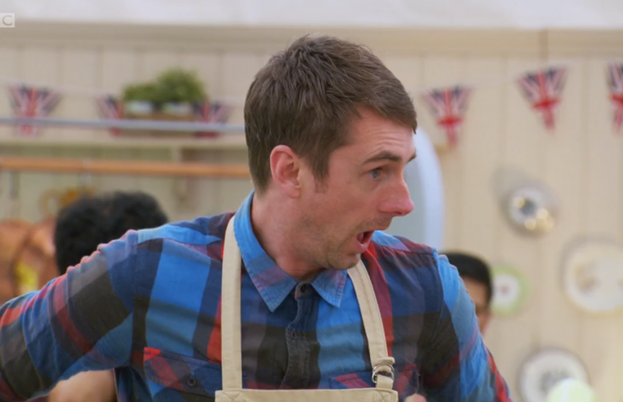 Having once suffered himself at the hands of a custardgate scandal during the dessert week in series four, Bake Off legend Howard Middleton offers his own insight on the week's events. 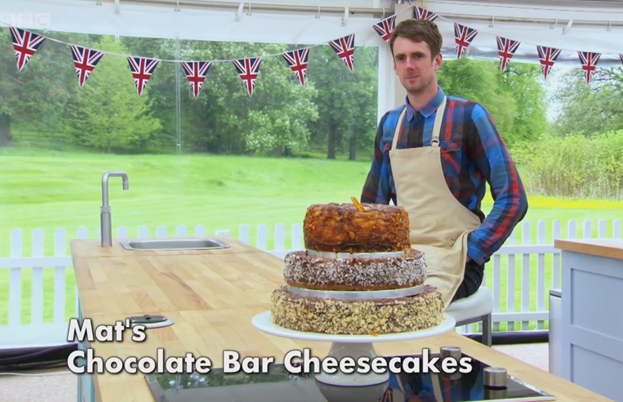 Rain clouds shatter the illusion of an eternal Bake Off summer. With cleverly inserted sweeping shots of sunny daisy-dotted lawns, clear umbrellas can’t hide the fact that this particularly wet weekend heralds a damp dessert week. The bakers’ signature challenge is to make twelve crème brûlées. Mary is insistent that she wants no blow-torched toppings. Championing the underprivileged (“Not everyone’s got a blow torch, Nadiya”), she wants things doing the traditional way. 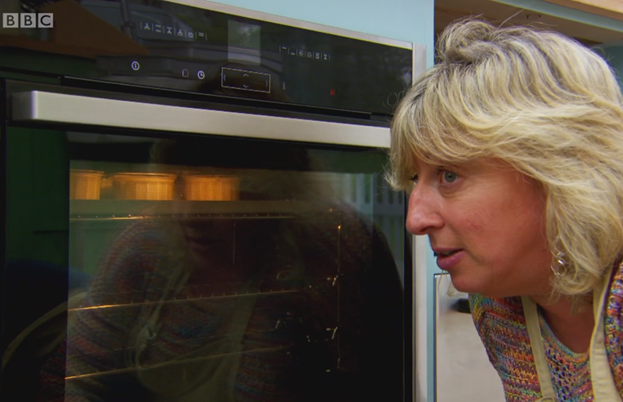 Fortunately Mary hasn't been watching BBQ Champ, nor is she sending the bakers out into the Berkshire wilds with a handful of flints – she just means an electric grill. Everyone is seeking the perfect wobble, but few achieve it. 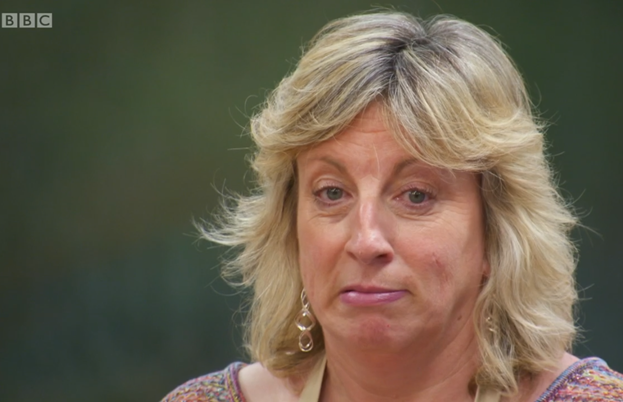 Sandy poetically explains that her combination of lemon and Pontefract cakes will taste ‘sublime’, but Paul thinks she forgot to turn the oven on and she’s met with a dozen little cup-a-soups. A nervous Alvin is confident that his blackberries won't seep, but yesterday he left his edible pansies on the train. That’s the problem with those announcements about leaving the train – they rarely remind you about your edible pansies. Flora is pulling out all the stops with her rhubarb and ginger pots, adding rhubarb crisps and delicate biscuit bangles, which Mel models, much to everyone’s horror. Tamal also goes gingery with a rhubarb compote that’s deemed to be lovely. Ugne is introducing Mary to marula fruit liqueur. Mary is happy with the crème but misses the caramel. Baker Paul says he’s going for an adult-themed brûlée. Mary looks a little worried about pre-watershed broadcasting, but it’s a case of his almond liqueur being too boozy. 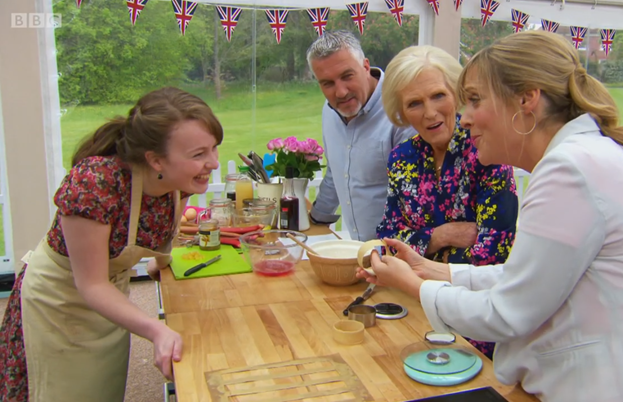 Nadiya’s tea-flavoured cups look a teetotal treat. Ian adds pomegranate seeds and pomegranate molasses for fruity contrast. Mary thinks it’s interesting. The male judge doesn't like it. Mat hopes his coconut and lime offering has a touch of sharpness. It’s sharply judged to be “not good enough”. The technical challenge is that Austrian classic the Spanische Windtorte. I'll pause whilst you look this one up. 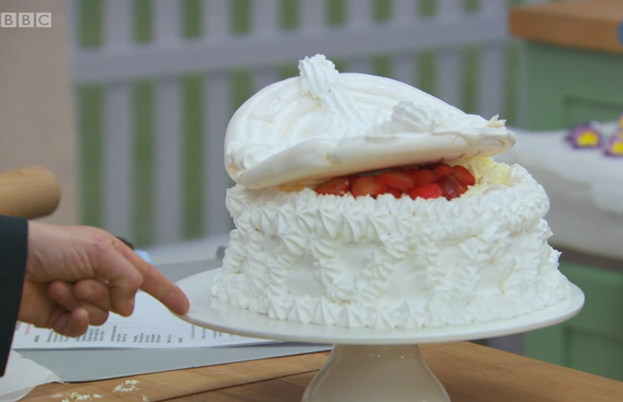 Apparently it’s a shell of French and Italian meringues encasing fruit and cream. Oh and it’s decorated with violets. Alvin is kicking himself at the loss of his intercity pansies. It reminds me of my own shortfalls of baking knowledge. Yes, I tried to maintain an illusion of culinary awareness when other bakers were talking about cannelés and cacao and Franco Prussian meringue buttercream, but frankly I was desperate to get home to check the flipping things on Google. The exemplar Spanische Windtorte looks like one of the late Queen Mother’s hats. Gawd bless ‘er. 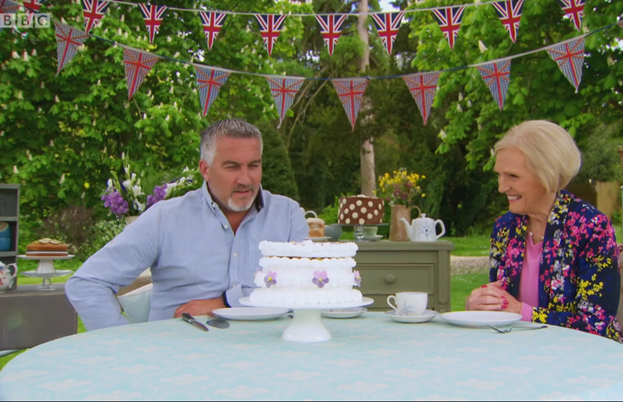 Paul and Mary coo in their little tent, but faced with this saccharine crown, I think I’d opt for cheese and biscuits. 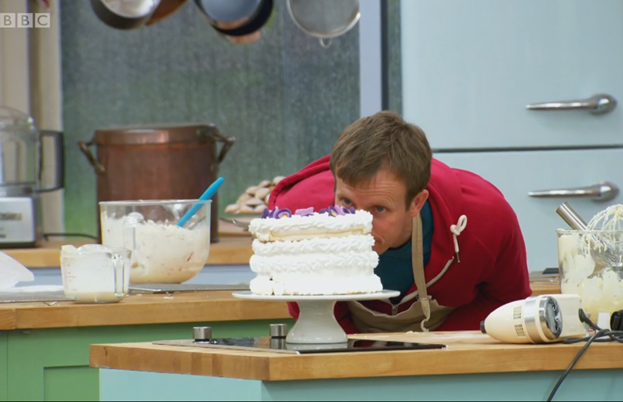 Mat is aiming for his meringue to be thick and glossy, “Just like a Labrador”. Confinement to the tent has taken its toll – he is officially stir crazy. I probably need to get out more, but I’d never heard of such a thing. Back to Google. Apparently it’s quite a popular alternative to traditional wedding cakes. Well so are stacked cheeses, so there’s an idea for the next series. The trouble with any of these stacking things is that I suspect I’m not the only viewer precariously balanced on the edge of my seat. Add the frantic music, time running out and the very soft quality of tent-temperature cheesecake and I find that unmissable TV is fast becoming unwatchable TV. Sandy’s tribute to the immigrant communities of New York doesn’t quite stack up. She’s left with two out of three and a hanky of tears. However, some bakers get the balance right. 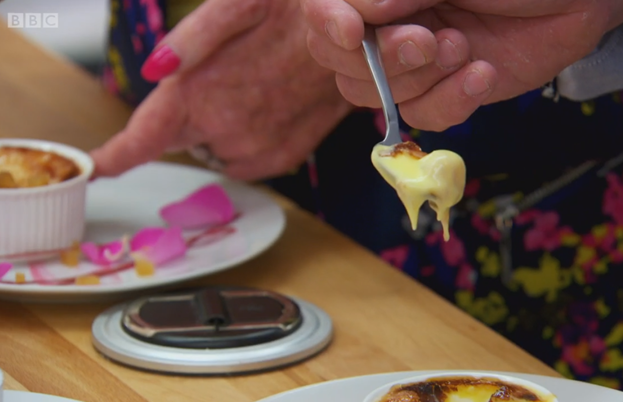 Nadiya goes for fizzy pop flavours, presented with a soda stream of meringue, which Paul calls ingenious. With a theme of sweet nostalgia, Mat chooses classic chocolate bars of coconut, honeycomb and peanut, which turn out to be fantastic. 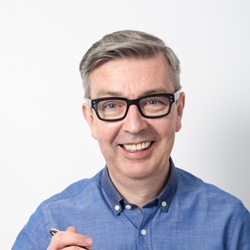 The BBC execs sleep easy, thankful that nobody mentioned Bounty, Crunchie or Lion bars. Flora completes her three elderflower cheesecakes and worries that she hasn't done enough. She frowns her fretful-Flora face and makes emergency macarons. Ian sticks his neck out with an ambitious mix of herbs and spices. Tamal’s honey, rosemary, mango and hazelnut cheesecakes are ‘fantastic’. 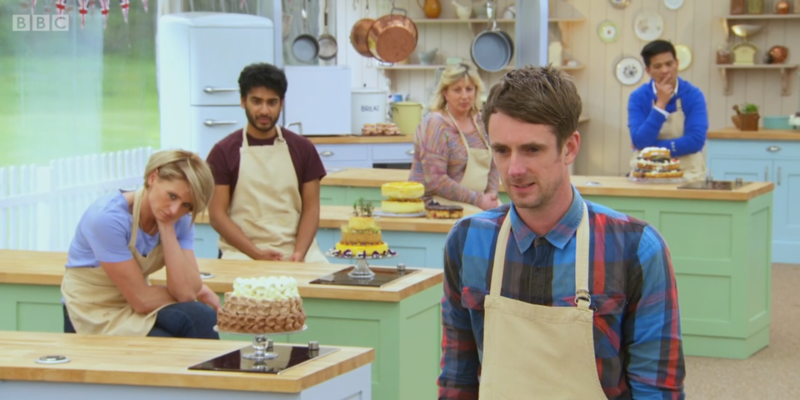 For a moment it looks like Tamal is surely a shoo-in for star baker but it’s a scarily overexcited Ian who scores the hat trick. 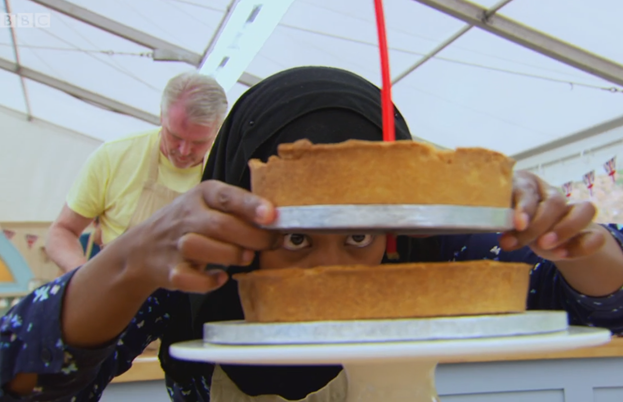 Nadiya fakes a little frustration. Flora frowns her fretful-Flora face again.